Activists to Cuomo: Have a Heart – Fix Our Broken Parole System! 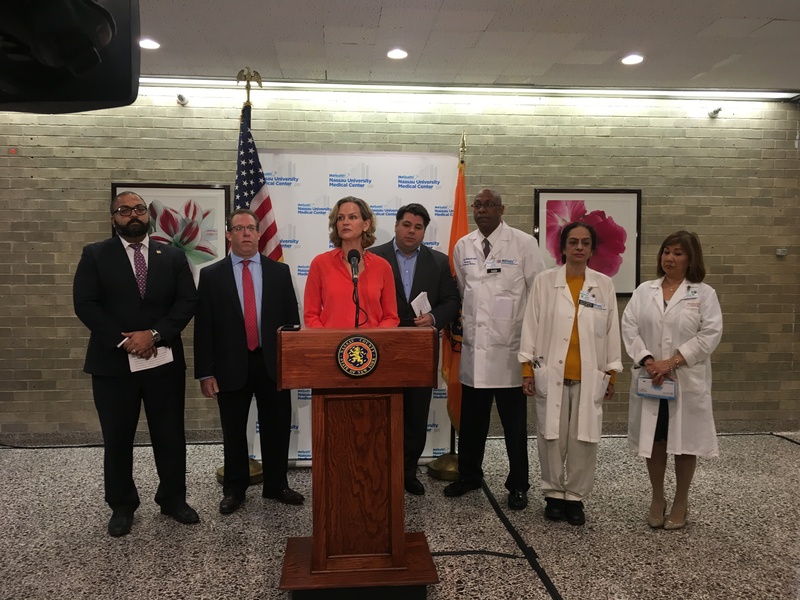 Nassau County Executive Laura Curran was joined by Nassau County’s Commissioner of Health Dr. Larry Eisenstein, Nassau University Medical Center (NUMC) board chairman George Tsunis and State Senator Kevin Thomas on Thursday, to address concerns about the increase in cases of the measles. Some regions of New York State are currently experiencing a measles outbreak, including the lower Hudson Valley and parts of New York City. If people breathe contaminated air or touch an infected surface, then touch their eyes, noses, or mouth, they can become infected. Curran said that since the start of the current outbreak, in late December, there have been more than 450 confirmed cases of measles in New York state. On Tuesday, New York City declared a public health emergency and said there would be mandatory vaccinations. “While Nassau County has not had a case of measles since 2013, we are on alert, especially with expected holiday travels within the next couple of weeks,” Curran said. The latest school vaccination rates for measles in Nassau County are 98.96 percent in public schools (Pre-K to grade 12) and 97.37 for private schools. Curran added that “the percentage of children with religious exemptions is . . . very low.” Those percentages for Nassau County are: 0.664 percent for public schools and 1.84 percent for private schools. According to the Vanderbilt University Medical Center, most religions have no prohibitions against vaccinations. But some do. The symptoms of measles generally appear about seven to 14 days after a person is infected. Measles typically begins with a high fever, and several days later a characteristic rash appears on the face and then spreads over the body. Residents with concerns can call Nassau County Department of Health at 516-227-9697 or call their healthcare provider.